So a while back I was making a purchase on Thinkgeek and decided to spend some of my geek points. These are bonus points you accumulate as you buy stuff, that can be used to get more stuff. Kind of like Camel Cash only you’re not destroying your lungs and they’re less likely to quietly shut down the program leaving you with a sack of now worthless paper that you saved up over ten years of throwing your health and money away. Not that I’m bitter. 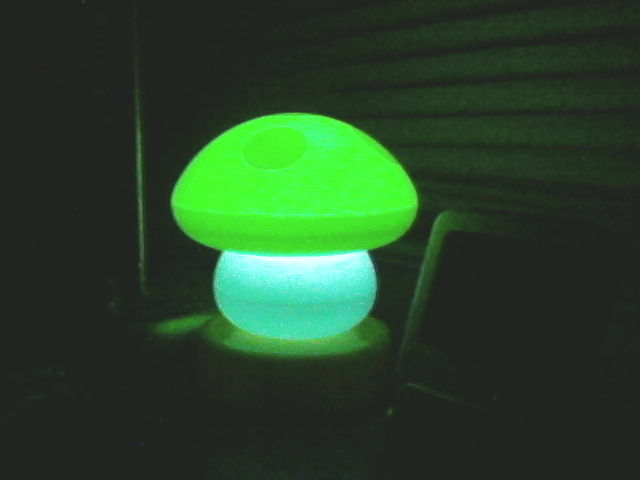 Anyway, I chose the green mushroom lamp. To be honest it really caught my eye because it was listed twice with two different geek point costs. (And I totally failed to check how many they actually deducted for it. Accounting seems easier when there’s a dollar sign on the numbers.) It’s the perfect sort of purchase for geek points, something I want to check out that I don’t want to spend actual money on. The best pic my cheap little phone camera could manage. I like the strange little lamp, and thanks to it I noticed something interesting about the way contrast changes the character of a room. See in my bedroom there are two sources of light that annoy me when I’m trying to sleep. One is a streetlight that seems to aim for my eyes through every tiny crack in the blinds, and the other is the crack under the door which seems really offensively bright in the middle of the night. Sometimes I’ll throw a blanket against the door or try to position my chair so it blocks some light, but most of the time I just suffer. But the mushroom lamp changes everything. The gentle green glow isn’t harsh enough to really disturb me, and yet it washes out these two sources of annoyance. For most of the last week I used it as a night light and I never found myself glaring at a light source. I’d still prefer no light but the stars and moon, I’m sure. But there’s a definite improvement and it so intrigues me that adding more light to the room makes it more comfortable. It’s the diffuse nature of it, of course. There’s more light, but it’s spread out fairly evenly rather than concentrated in a few points. Much the same way a swimming pool that’s been in the Sun during a hot summer day has far more heat than a soldering iron, yet cannot burn you as the latter could. Or perhaps how a sharp point pierces with much less pressure than a blunt one. Come to think of it Sun Tzu addresses this concept in the Art of War. I think the way he framed it was that your enemy cannot strengthen one point without weakening others, so find the weak points and focus your strength there and you will win even if you are much weaker overall. Though he’d be puzzled by the technology involved, Sun Tzu would probably understand very well how adding more light could take the sting out of the ones that bother me. Posted on June 3, 2012, in Daily Post and tagged mushroom lamp, pointless rambling, postaday2012, still holding out hope I'll find a use for that camel cash, Sun Tzu, thinkgeek. Bookmark the permalink. Leave a comment.